The firm of O'Malley Tunstall, PLLC is dedicated to assisting the injured and disabled. Our firm began when Jimmie Keel first started the solo practice of law in 1983. He narrowed his practice to the civil practice of law with medical-legal related matters. 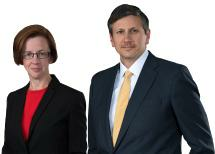 Susan O'Malley joined Jimmie in 1995 and they first became law partners in 1998. The focus of the practice continued to narrow as the knowledge of the firm centered around personal injury, medical malpractice, social security and workers' compensation. Although Susan has tried numerous civil jury trials, including some with recoveries in excess of $1,000,000.00, she found her calling in Social Security Disability. Susan is Board Certified by the North Carolina State Bar in Social Security Disability, has spoken on this topic throughout the Continental U.S., Hawaii and has even been an invited speaker in Toronto. She is the past president of the Disability section of the North Carolina Advocates for Justice (formerly North Carolina Academy of Trial Lawyers), has been a member of their Board of Governors and is past president of the American Association for Justices' Disability Section.